*Received physical ARC from publisher in exchange of an honest review. As the synopsis implied, the second book certainly ended with a bang, in regards to the characters coming to various revelations. As for Mary, that revelation struck her hard and intensified her obsession with Reeve. Hence we have her character going OD on her mission to seek revenge. WARNING: If you disliked Mary's character from the first book going into the second, then your hatred for her will only go straight to the roof in Ashes to Ashes. Because in the third and what I deem to be the final book in the series, she's a complete villain. And I'm talking the scary kind that even taps into your dreams to make her presence and anger known. Okay, so before I touch on what a complete psycho Mary blossomed into, let's talk about the story. 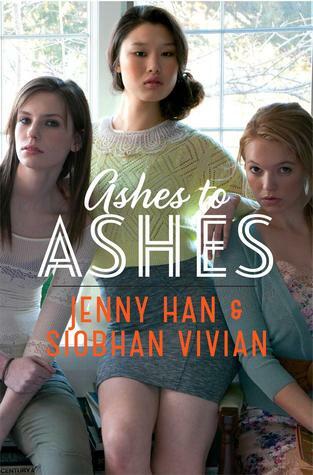 Ashes to Ashes picks up from the death of a girl who was once the core of their revenge pack, Rennie. Everyone's in mourning. Boo hoo. Rennie's dead and they're utterly lost in guilt. I could care less about that part because that chick was annoying as hell. I know that's sad, because yeah, she died, but her character was too damn unlikable. Anyways, Lillia, Kat, Reeve, and Alex along with everyone else is trying to cope with the loss of a once friend and is trying to get through the remaining days of high school. It's tough for Reeve and Lillia because we all know what transpired in the second book and I was actually rooting for them to progress in Ashes to Ashes. I know it's kind of bad, where Mary and friendships are concerned, but I like the intensity between Lillia and Reeve and I literally felt their emotions seep out of every page. It was a sweet romance that I wanted to work. As for Kat, she's still preoccupied with making a decision as to whether she should remain on the island and help out her dad and brother or go off to college. I would have loved for her friendship with Alex to turn into something more, and had anticipated it in the second book, but I was disappointed that nothing happened in Ashes to Ashes and Alex is pretty much still strung up on his old and played out crush on Lillia. It seemed everything is always about Lillia, isn't it? Like the first two books, I gravitated more towards Lillia's character because I felt like she had more pages than the other two, especially Mary. We rarely got inside of her crazy head. But I liked that the story opened up with her and we see how much revenge has taken over her sense of rationality. Not only that, she blames Reeve for her suicide, even calling him a murderer. Now, I may not have ever been bullied nor have I witnessed it, but don't the bully win when the victim takes his/her own life? I felt that Mary was just straight up annoying and her reasons for wanting to take revenge were beyond atrocious. I mean, you'd think she'd know that taking a life won't land her in a nice place. Sadly, it nearly took the life of her friends for her to come to the realization that the only way she'll find peace is if she accepts that her suicide was her doing and no one else is to be blamed for that. For the most part, Ashes to Ashes depicted the characters preparing for the next step in their lives, along with missing a friend who they once conspired with. Kat and Lillia don't figure out what's really up with Mary until the middle so in the chapters before that, we have a lot of mischief surrounding them, along with Lillia and Reeve working on the feelings they have for each other even though no one likes the idea of them being a couple. Not much happened aside from Mary doing these little hauntings and causing problems for Kat and Lillia, but then once they found out the truth about her things started to heat up and we really get into the paranormal aspect of the story. I'm talking spells and bindings. It seemed to be working until someone is unable to hold off her feelings and Mary ends up free to cause chaos again. The way she saved them in the end was the nicest and most likable thing about Mary, for me. That was the only time throughout the series that I wasn't irritated by her. As for the way things turned out, I felt like the ending was a tad rushed and overall I'm not as satisfied. I really wanted things to progress with Lillia and Reeve, especially with how strong their love was, and I hated how Kat had to go through another loss. So sad. All in all, Ashes to Ashes was a good read. The writing is still easy and very fast-paced. The characters are likable and unique in their own way, so much that you don't know who's writing as who, and I feel like readers can relate to either of them. With the way the story concluded, It seems like this is in fact the end of the series, and by that I can say I really enjoyed it. Intriguing, mysterious, a dab of paranormal, re-constructing friendships and the addition of some intense romance, this is truly a solid YA and I recommend you pick the books up if you haven't started the series as yet. You're definitely missing out. Thanks, Chloe. I hope you do soon. i loved burn for burn, i can't wait to read this! I've heard such good things about this series! Mary sounds intriguing and bad intense! I'm glad you enjoyed Ashes to Ashes, Shane. Thanks for the review! Hey, Drea. Hope you read it soon. It's an interesting story. I've heard so many good things about these books but for some reason I've never had a chance to pick them up, I definitely should though they sound good! I haven't seen any review for this, yet. Good to know about Mary! Thanks for coming by Kate.